A. First, log into your Account. This will take you to the Customer Account Page. Find your 'Wallet' and click on 'Redeem Gift Certificate'. This will show your current Gift Certificate Balance as well as allow you to enter a new Gift Certificate Code. Then, when you're ready to pay for your order with your Gift Certificate balance, find the 'Pay With' box on the Checkout: Shipping/Payment Selection Page and click on it, then click on 'Available Credit Balance'. If your total order is more than your Gift Certificate Balance, it will allow you to pay the remainder by credit card or Paypal. If your order is less than your total Gift Certificate Balance, the remaining $ will be kept in your Wallet for future use. A. (Large quantities, special displays, items or gift packs not shown on our site, etc. ): Please make requests through email to: olivebranchbodycare@comcast.net. Order confirmations due by Sept 1st of that year. Q. Olive Branch Saturday Skin Care Party. A. Hosting a natural skin care party for your friends, neighbors and family on a Saturday afternoon or evening is a great way to try our products, share with friends and ask questions. 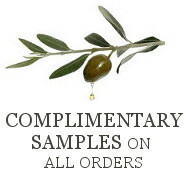 For hosting a party, you'll receive $100 worth of Olive Branch products of your choice.The host provides the space and invites guests (min of 5 people) and Olive Branch provides the skin care products and personal service. If you're interested and live in Seattle, please email Joan Johnson at: olivebranchbodycare@comcast.net. A. We are currently an online store and do quarterly Street Fairs/Events (please see our Events page). We also have some products on Amazon.com and are in the process of looking at getting into local stores. A. Please choose the 'on-site' shipping option during check out. Once your order is received, you will receive an email to coordinate a time for pick-up. If you have any other questions, please contact us at: olivebranchbodycare@comcast.net.